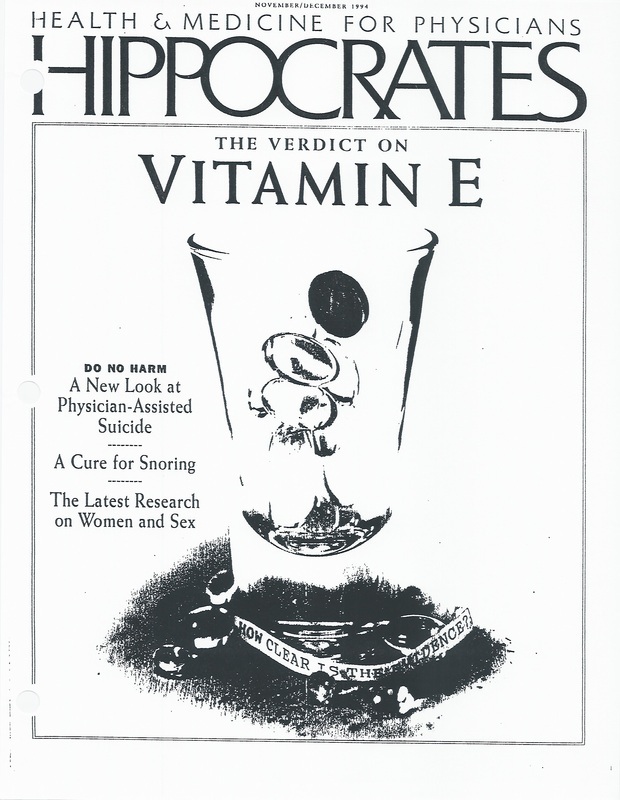 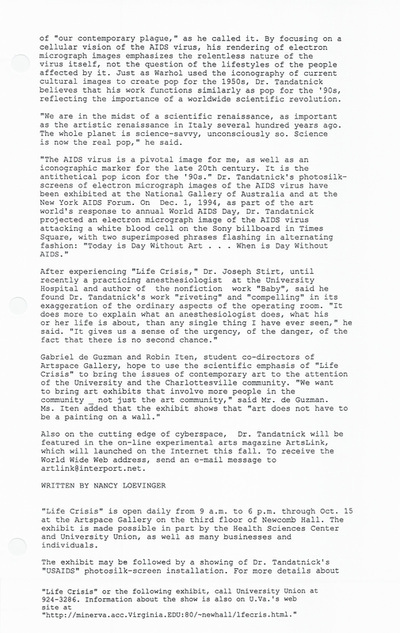 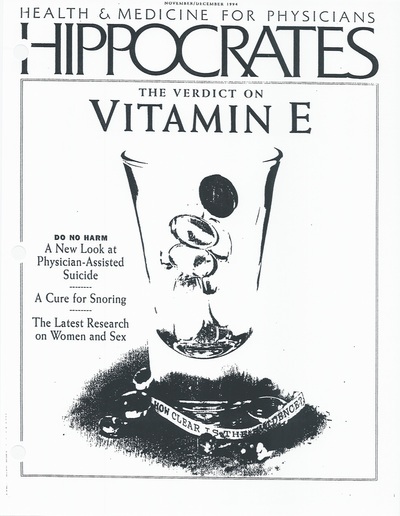 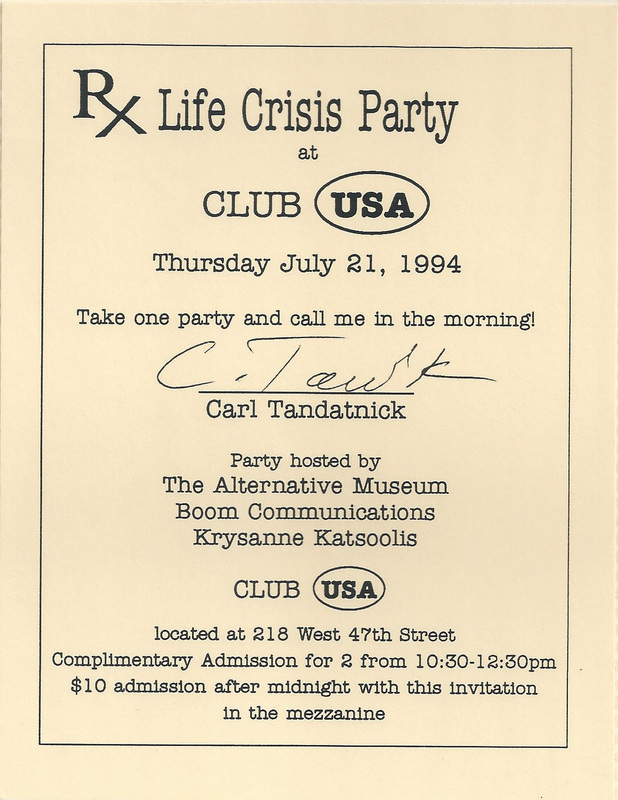 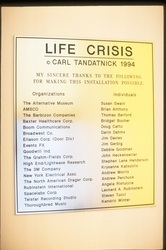 Carl Tandatnick, an artist who is also an anesthesiologist, presents "Life Crisis" at the alternative Museum. The Artist will convert the museum's Gandhi gallery into surrealistic Operating Room. 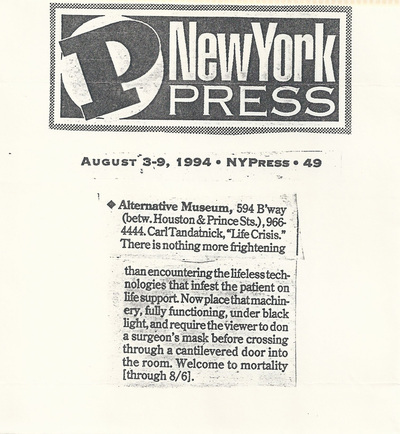 Viewers who want to enter this space must put on an operating mask. 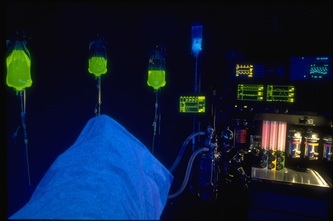 Through the steel doors of this dimly lit operating theater, the artist presents us with a room lined by 108 glowing I. V. bags that fluoresce various colors. 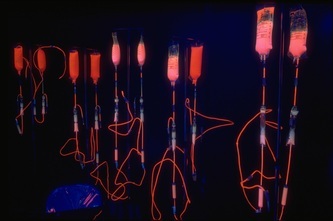 Each color represents different stages of life and death. 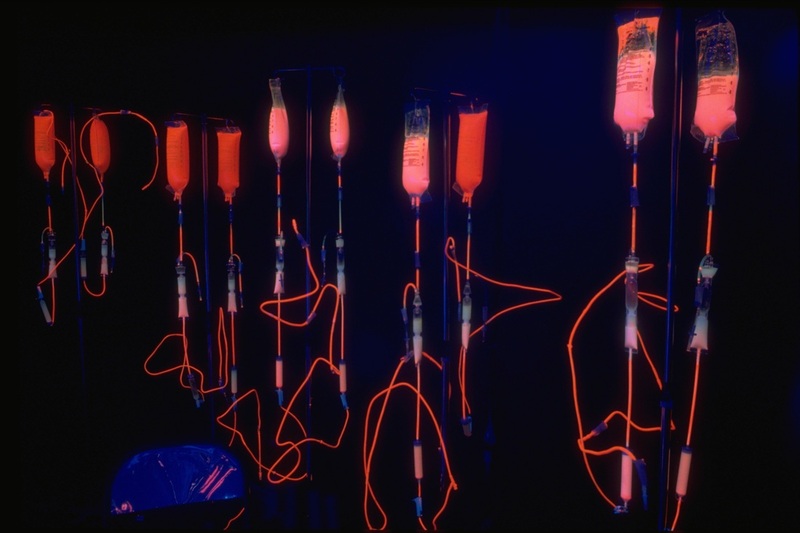 Alongside these I. V. tubes are mirrored chairs that reflect the masked viewer and are a metaphor for the chairs we occupy in our own lives. 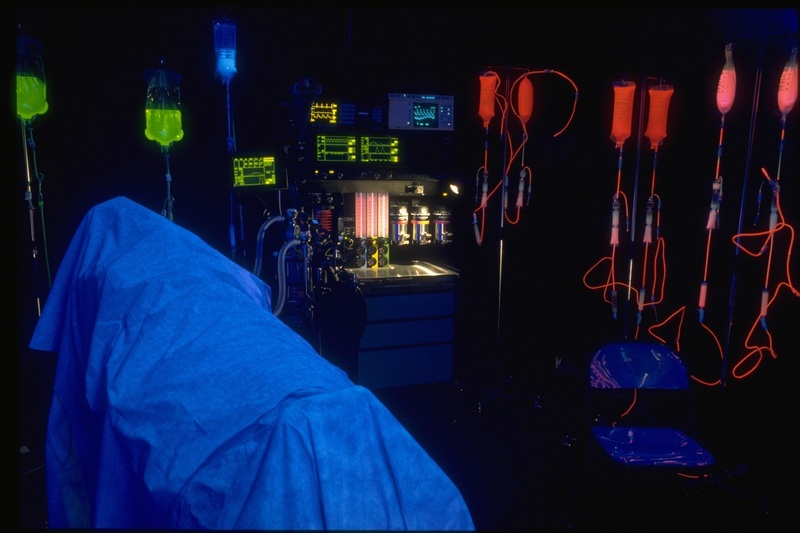 At the far end of the room is an operating table, surrounded by X-rays, an electrocardiogram, and an anesthesia machine with ventilators that periodically switch on and off. 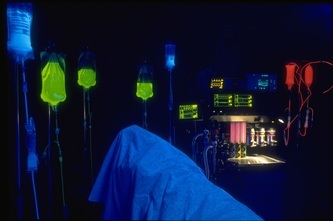 The operating table is covered with drapes, that rise and fall, simulating a patient’s breathing. 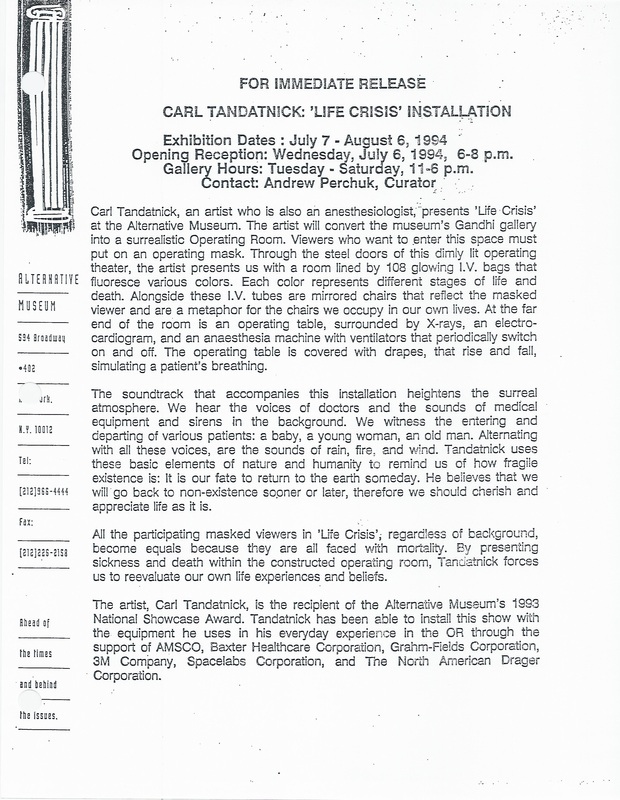 The soundtrack that accompanies this installation heightens the surreal atmosphere. 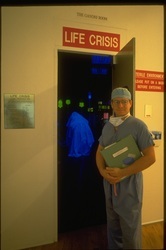 We hear the voices of doctors and the sounds of medical equipment and sirens in the background. 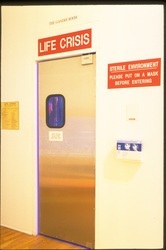 We witness the entering and departing of various patients: a baby, a young woman, an old man. 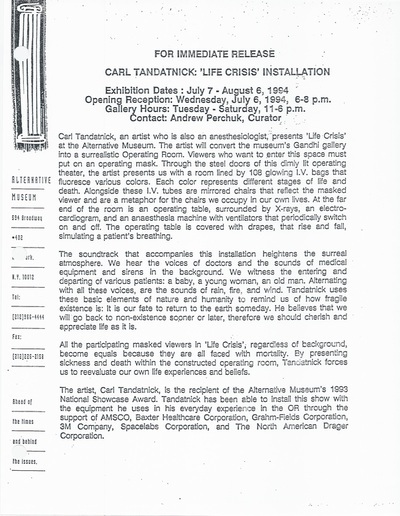 Alternating with all these voices, are the sounds of rain, fire, and wind. 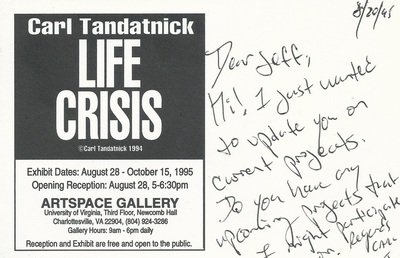 Tandatnick uses these basic elements of nature and humanity to remind us of how fragile existence is: It is our fate to return to the earth someday. 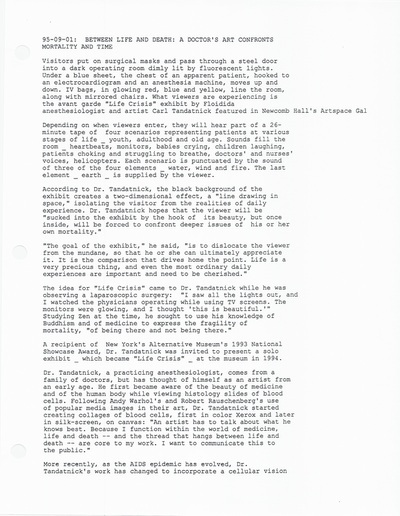 He believes that we will go back to non-existence sooner or later, therefore we should cherish and appreciate life as it is. 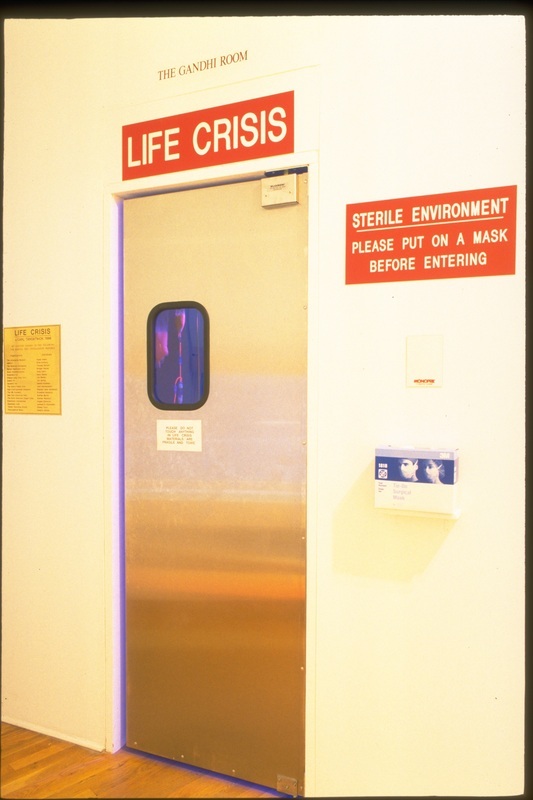 All the participating masked viewers in "Life Crisis," regardless of background, become equals because they are all faced with morality. By presenting sickness and death withint the constructed operating room, Tandatnick forces us to reevaluate our own life experiences and beliefs. 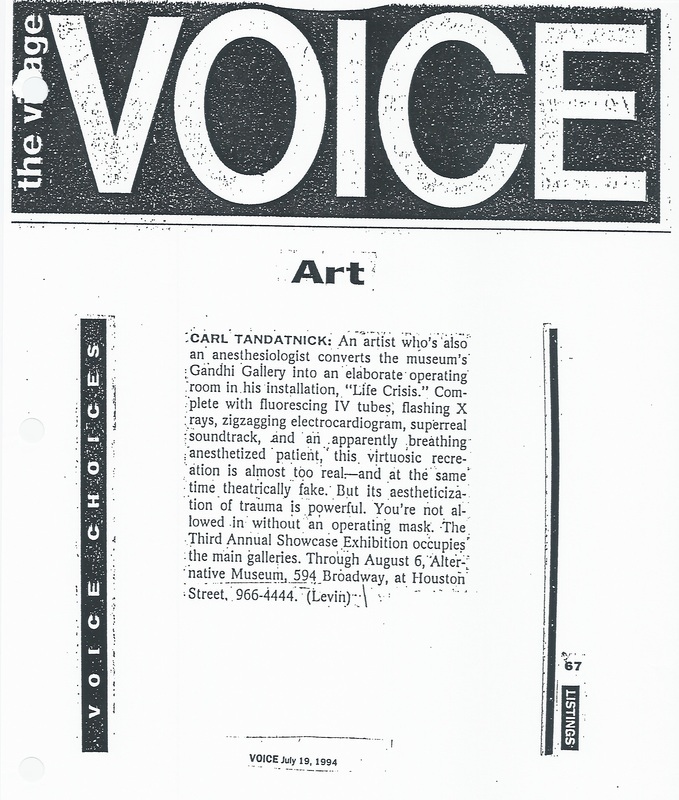 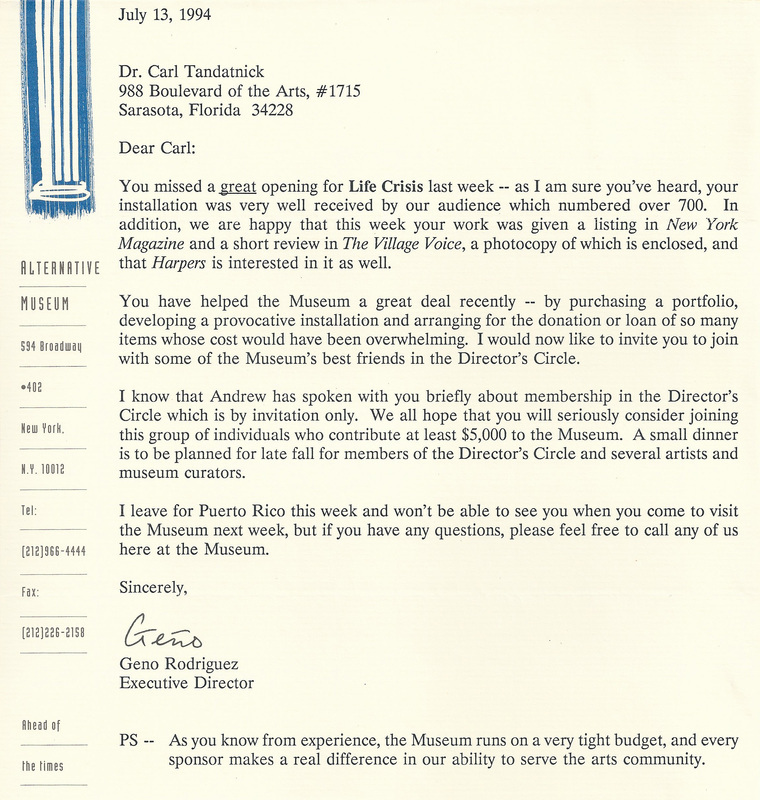 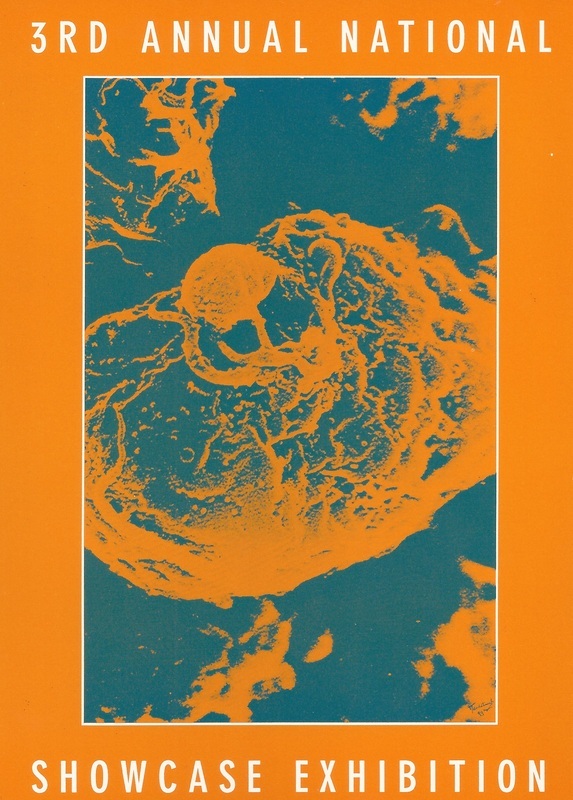 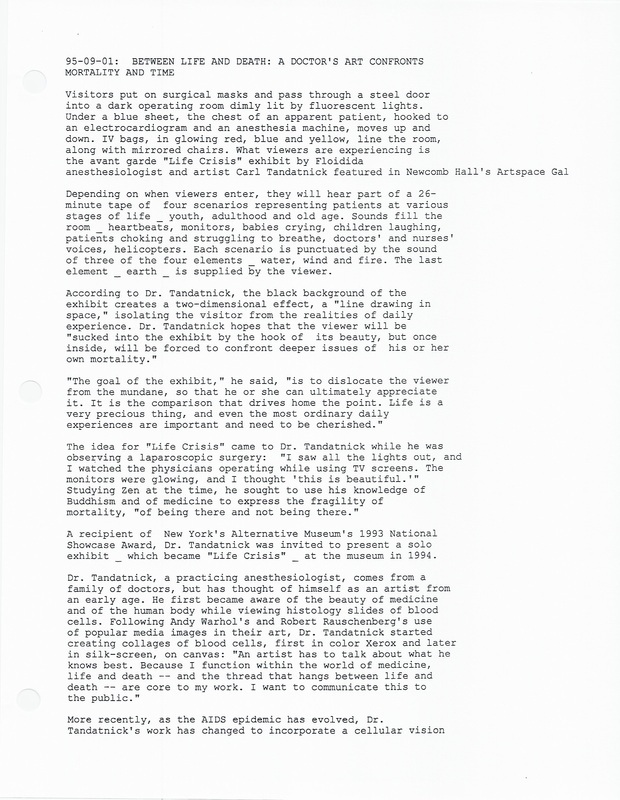 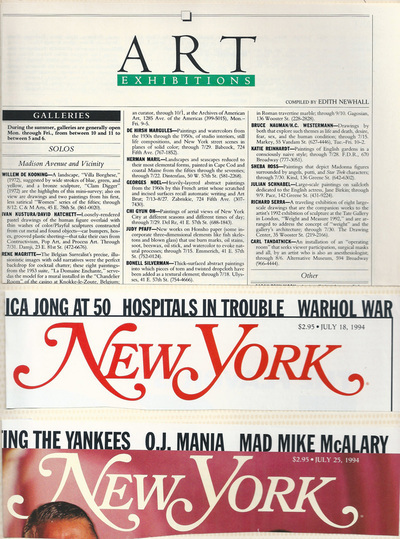 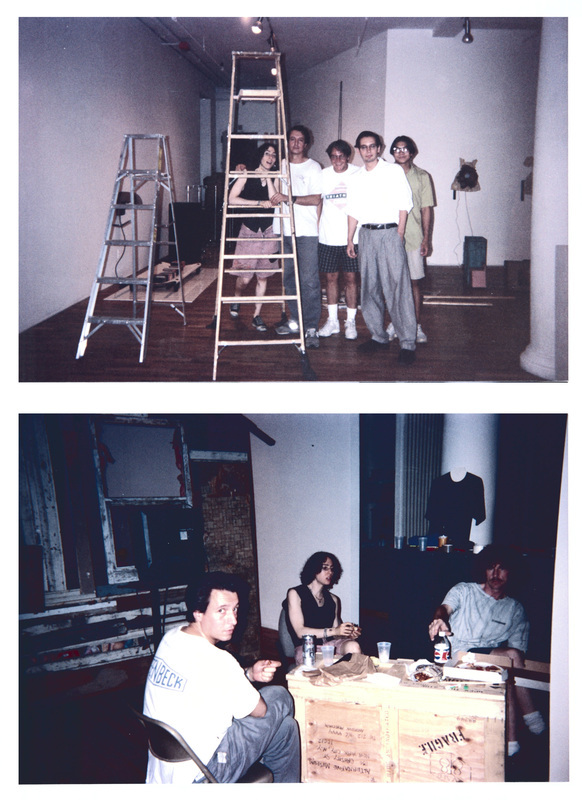 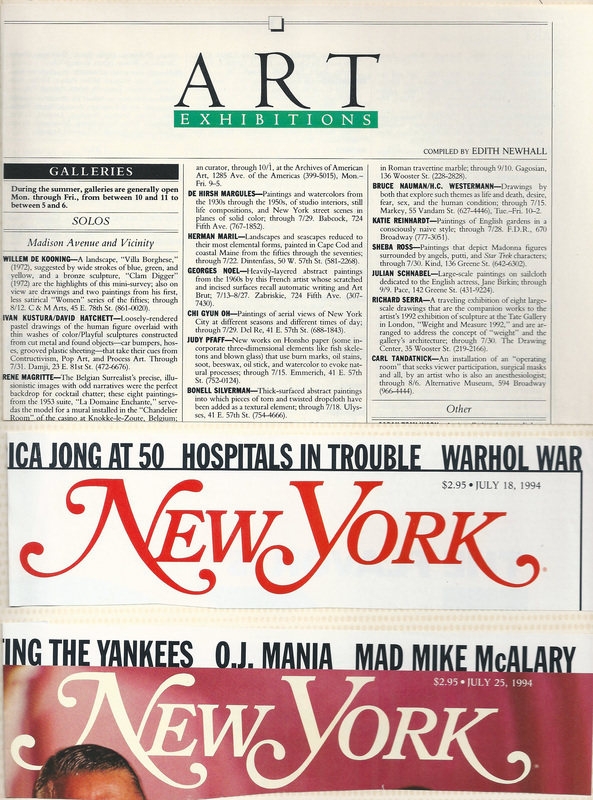 The artist, Carl Tandatnick, is the recipient of the Alternative Museum's 1993 National Showcase Award. 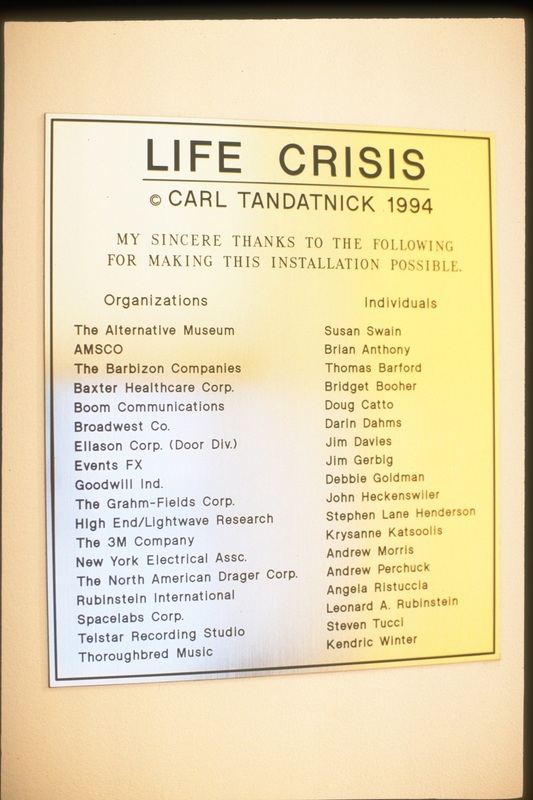 Tandatnick has been able to install this show with the equipment he uses in his everyday experience in the OR Through the support of AMSCO, Baxter Healthcare Corporation, Grahm-Fields Corporation, 3M Company, Spacelabs Corporation, and The North American Drager Corporation. 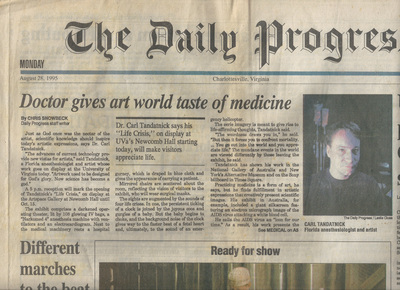 Just as God once was the nectar of the artist, scientific knowledge should inspire today's artistic expressions, says Dr. Carl Tandatnick. "The advances of current technology provide new vistas for artists," said Tandatnick, a Florida anesthesiologist and artist whose work goes on display at the University of Virginia today. 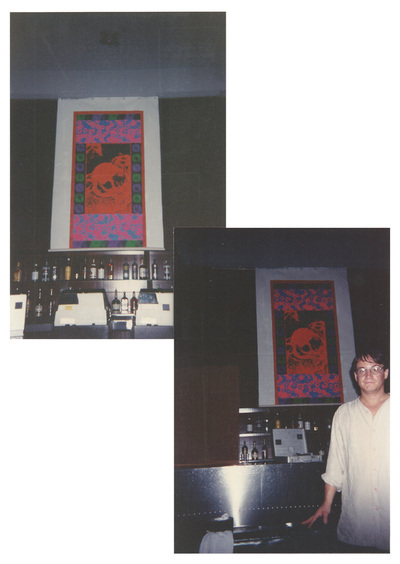 "Artwork used to be designed for God's glory. Now science has become a god." 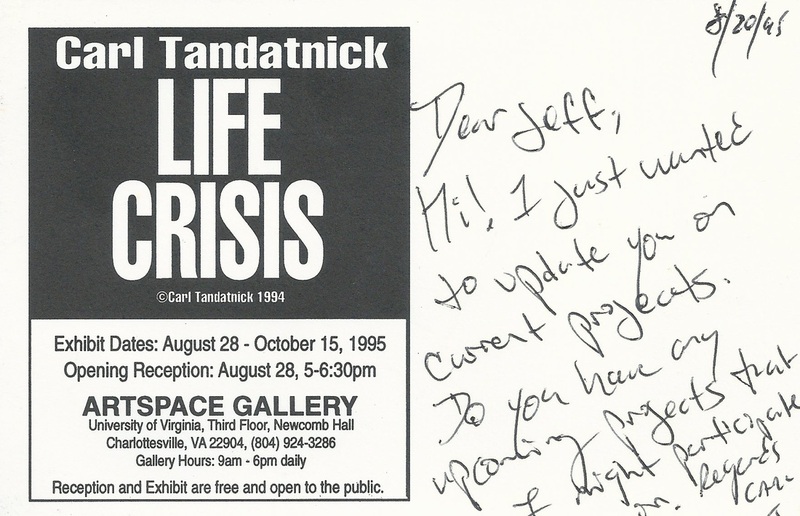 A 5 PM reception will mark the opening of Tandatnick's "Life Crisis," on display at the Artspace Gallery at Newcomb Hall until Oct. 15. 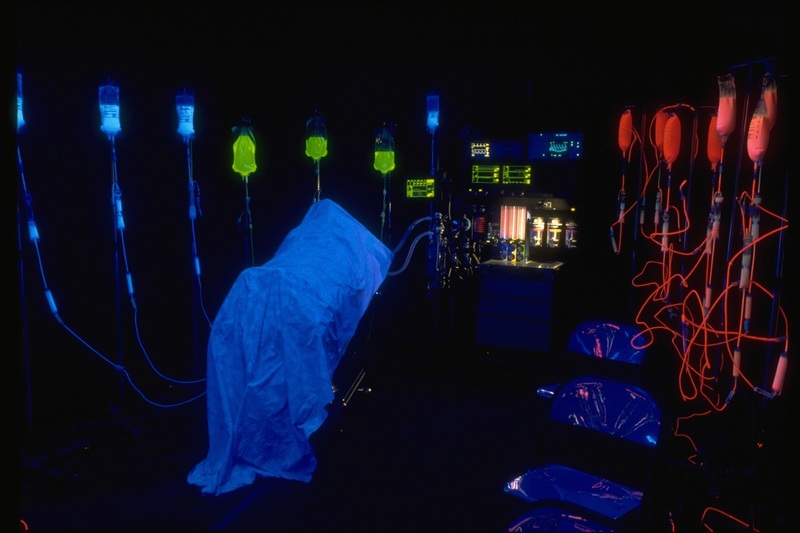 The exhibit comprises a darkened operating theater, lit by 108 glowing IV bags, a "Narkomed 4" anesthesia machine with ventilators and an electrocardiogram. 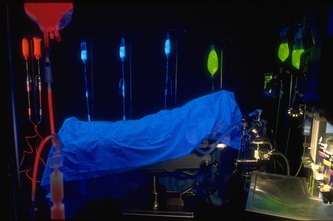 Next to the medical machinery rests a hospital gumey, which is draped in blue cloth and gives the appearance of carrying a patient. 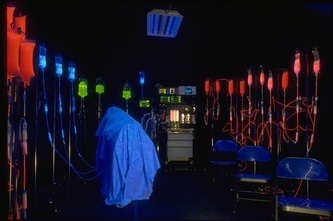 Mirrored chairs are scattered about the room, reflecting the vision of the visitors to the exhibit, who will wear surgical masks. What does a physician see and feel and hear in an operating room? 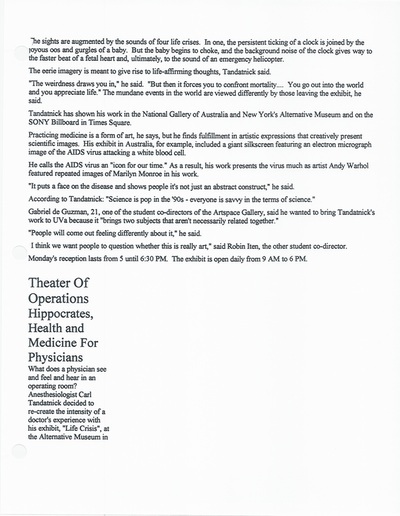 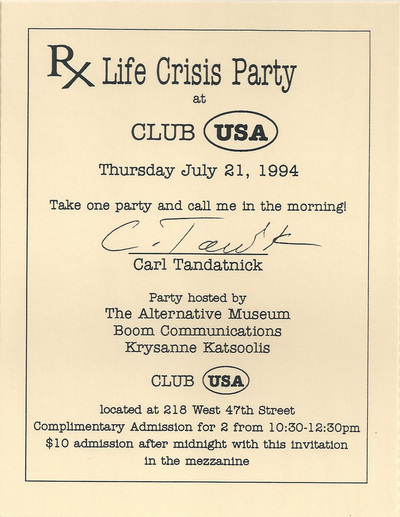 Anesthesiologist Carl Tandatnick decided to re-create the intensity of a doctor's experience with his exhibit, "Life Crisis", at the Alternative Museum in New York. 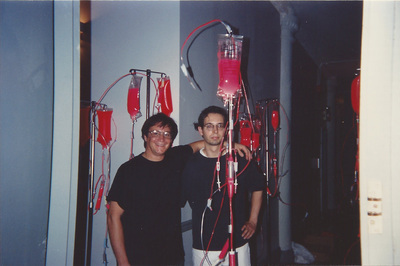 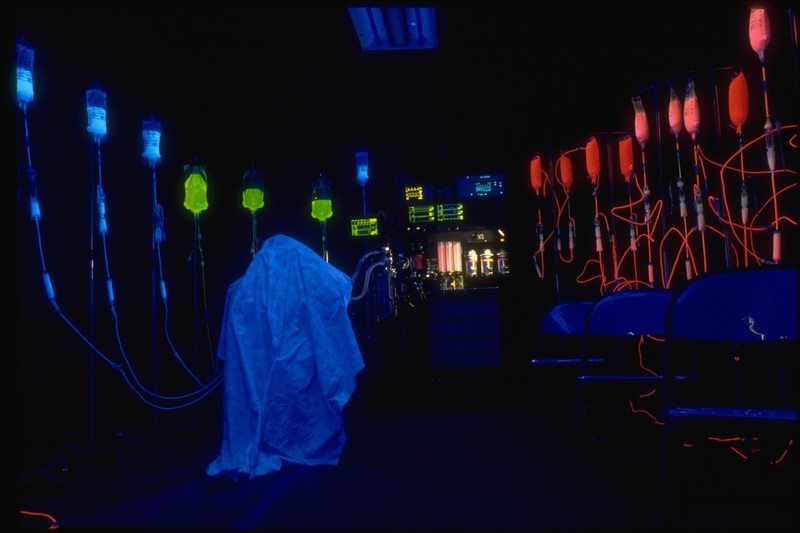 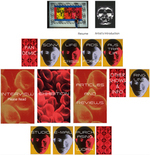 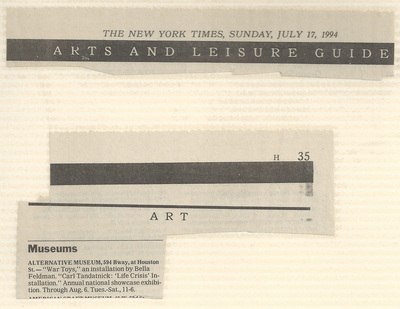 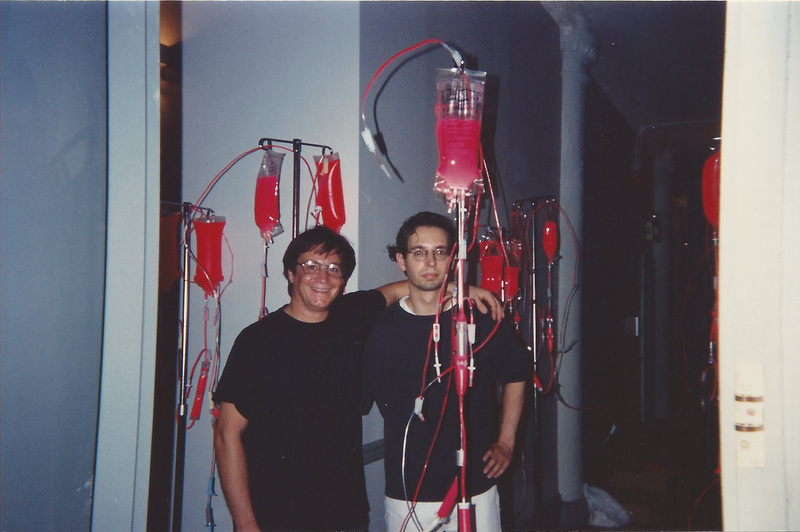 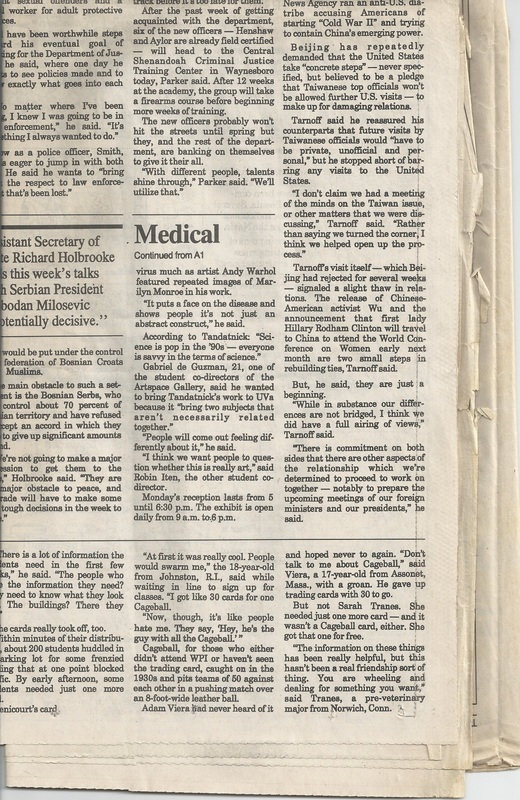 From July 7 to August 6, 1994, visitors to the installation donned operating masks, passed through a large steel door, and walked a gauntlet of 108 glowing IV bags, their own images reflected on mirrored chairs. Drapes on an operating table moved as if a patient breathed beneath them, medical equipment beeped and whirred, sirens sounded, and the voices of doctors and dying patients alternated with the rush of wind, rain, and fire. 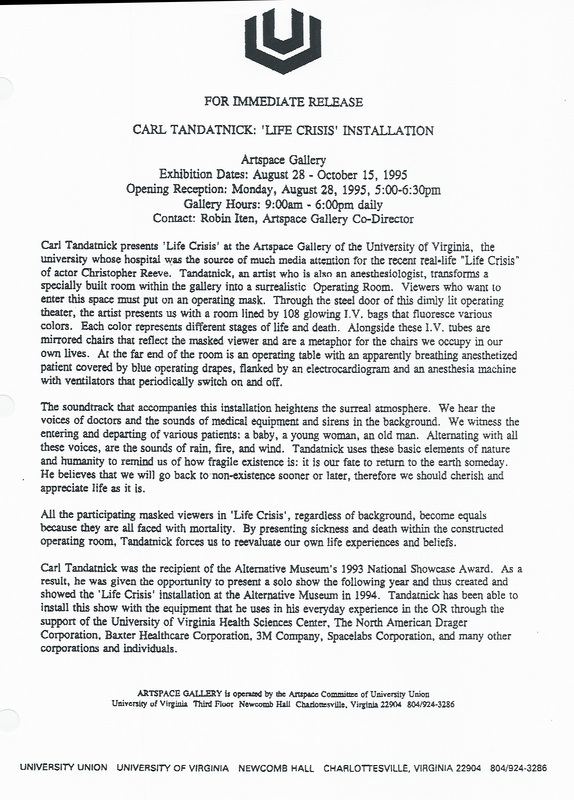 After the exhibit was dismantled, equipment was returned to the various companies that had supplied it. 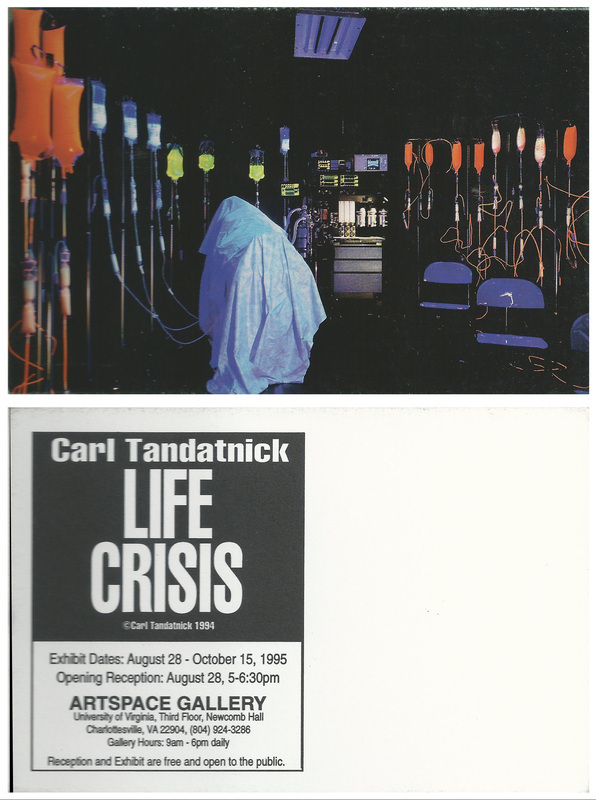 Carl Tandatnick: And artist who's also an anesthesiologist converts the museum's Gandhi Gallery into an elaborate operating room in his installation, "Life Crisis." Complete with fluorescent tubes, flashing X rays, zigzagging electrocardiogram, surreal soundtrack, and an apparently breathing anesthetized patient, this virtuosic recreation is almost too real—and at the same time theatrically fake. 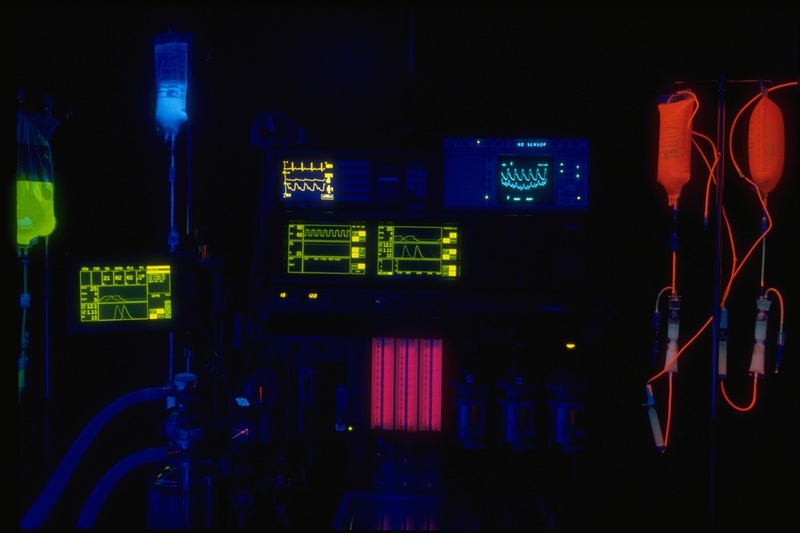 But its aestheticization of trauma is powerful. You're not allowed in without an operating mask. 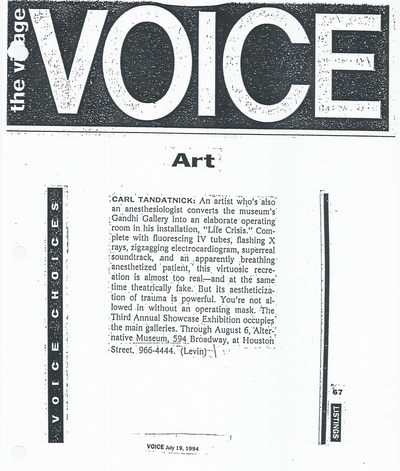 The Third Annual Showcase Exhibition occupies the main galleries. 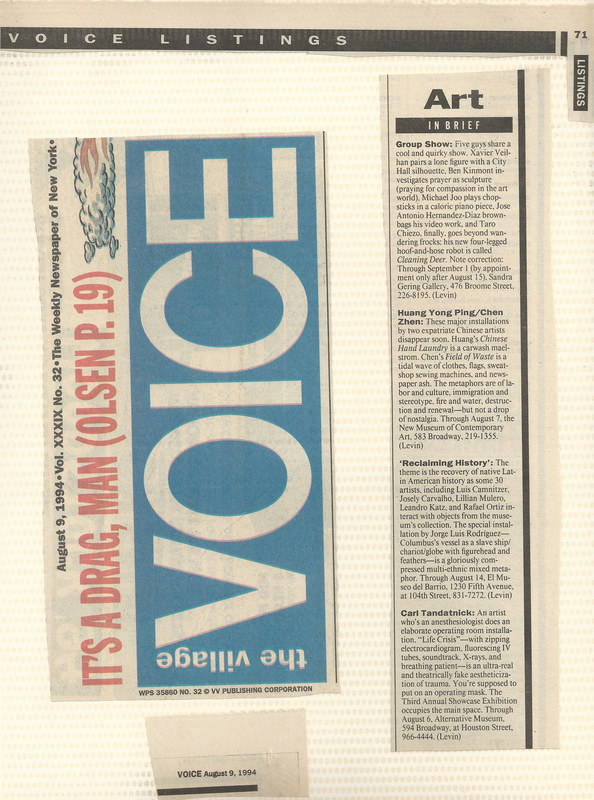 Through August 6, Alternative Museum, 594 Broadway, at Houston Street, 966-4444.